Lithuania has been one of Europe’s best-kept secrets. Trapped inside the Soviet Union for fifty years until proclaiming its renewed independence in 1990, this historic Baltic nation has lost no time rejoining the rest of the world. A certain resolve can be seen in Lithuanian faces. The people have endured the hardships of a harsh political and physical climate. Throughout its history names were changed as the state was constantly under attack or subjugation. And yet Lithuanians have managed to keep a fairly sunny outlook, despite the long years of adversity. The Lithuanians as a whole are welcoming, and happy to show visitors their country’s many charms. On getting to know them better, you will discover deeper qualities such as resilience, loyalty, and resourcefulness; Lithuanians are usually good at solving problems and always willing to help a friend in need. Ambition and modesty work in tandem to keep people moving forward but never putting on airs. The love of nature is also very much a part of the Lithuanian soul. Culture Smart! 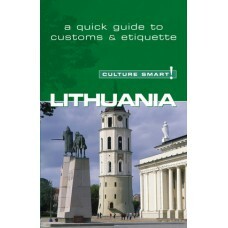 Lithuania sets out to explain the nuances and protocols of Lithuanian society so that you can avoid social faux pas and get closer to the people. It offers key insights into the cultural and historical background, and advice to guide you through different types of business and social occasions—but reading this book is just the beginning of the journey!